Meanwhile, rockets were discovered in a UN school close to 3,000 displaced Palestinians. 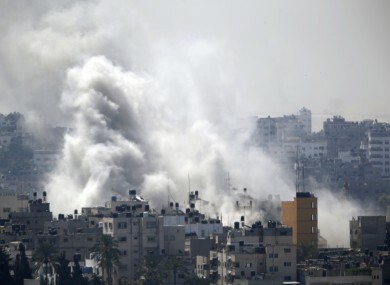 Smoke from an Israeli strike rises over Gaza City. THE UN HUMAN Rights Council has launched a probe into Israel’s Gaza offensive, backing efforts by the Palestinians to hold the Jewish state up to international scrutiny. The 46-member council backed a Palestinian-drafted resolution by 29 votes, with Arab and fellow Muslim countries joined by China, Russia and Latin American and African nations. The United States was the sole member to vote against, while European countries – including Ireland – abstained. In Dublin, a demonstration at the Department of Foreign Affairs by Gaza Action Ireland and the Ireland Palestine Solidarity Campaign was attended by around 200 people. The protesters were calling for the expulsion of the Israeli ambassador and for a suspension of Israel’s trading status with the EU. “The world has looked away for far too long,” Trevor Hogan, the ex-rugby international who visited Gaza last year, said. Washington’s top diplomat said global efforts to end 16 days of bloodshed in Gaza were progressing as the fighting raged on and airlines suspended flights over rocket fears. “The success of Hamas in closing Israeli airspace is a great victory for the resistance, and is the crown of Israel’s failure,” spokesman Sami Abu Zuhri said as traffic to Tel Aviv’s Ben Gurion airport slowed to a trickle after a rocket hit close to runways on Tuesday. As US Secretary of State John Kerry and UN chief Ban Ki-moon held talks in Jerusalem, they said they had pooled their efforts in the hope of boosting the quest for a truce in a conflict that has killed 685 Gazans, 34 Israelis and a Thai worker. “We have certainly made some steps forward, but there is still work to be done,” Kerry said as he met the UN chief for the second time this week. “We are now joining our forces in strength to make a ceasefire as soon as possible,” Ban said, warning there was no time to lose as concern mounted over the rising civilian body count. “We have in the last 24 hours made some progress in moving toward that goal,” he said before heading to Tel Aviv for talks with Israeli Prime Minister Benjamin Netanyahu. Britain was also poised to add its weight to truce efforts as new Foreign Secretary Philip Hammond flew in for late-night talks with Abbas, the president’s office said. Meanwhile, rockets discovered were in a vacant United Nations Relief and Works Agency (UNRWA) school in the Gaza strip for the second time in a week. The incident occurred between two other schools where a total of 3,000 displaced Palestians were being accommodated. UNRWA said in a statement that the discovery was made during a routine inspection and the number of rockets is unknown. The organisation “is pursuing all possible measures for the removal of the objects in order to preserve the safety and security of the school”, and said an investigation will be launched into the incident. Workers discovered 20 rockets at a separate school last Thursday, with The Wire reporting that these weapons may have ended up in the hands of Hamas. “This incident, which is the first of its kind in Gaza, endangered civilians including staff and put at risk UNRWA’s vital mission to assist and protect Palestine refugees in Gaza,” UNRWA said. Israel has repeatedly argued that Hamas hide rockets in locations like these to avoid detection. Email “UN rights council launches probe into Israel's Gaza offensive”. Feedback on “UN rights council launches probe into Israel's Gaza offensive”.